In our post "Advocate for an underdog and get 1000 Honest Cash Tokens." we asked Honest members to be be an advocate for an underdog and write a post on Honest on any topic surrounding; honesty, censorship or discrimination. Here are the tx's proofs: danigocrypto, numberofthings, cain, Big_Bubbler. have left invalid SLP addresses. Please update your post with the valid address and let me know on Telegram or Twitter about it. Our next give away will be on #FreeSpeech. You can start writing now! Nice to see such levels of participation. Will HCT always be distributed in response to a challenge like this or would there be other means to earn HCT as a matter of regular use and interaction on the platform in the future? I seldom respond to challenges and tend to write a post or comment according to what inspires and what I find interesting. I find it hard to write on cue and then there is the matter of having limited available time. For now, yes. We're planning weekly challenges, every week, every topic. Hi, please also pay attention to bug reports i sometimes send you in email - such as the italic bug. 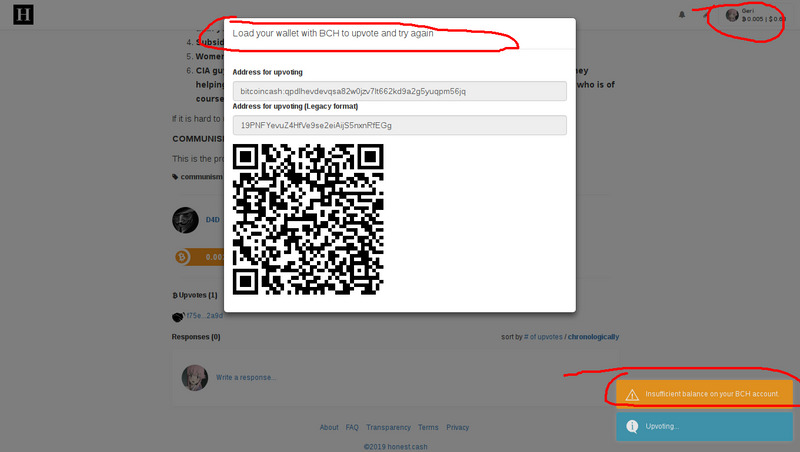 Also, the site does not works properly when there is no confirmations on the transactions yet. I'm sorry if you experienced some delays in the email answers. We are receiving a lot of them last weeks and I have to admit, it's more than we can process at the current team size. So this will be a wormhole token? Wondering how that works. Would like to see some information about Wormhole here. We use SLP tokens. SLP stands for Simple Ledger Protocol. Wormhole protocol, although seemingly promising, is currently an abandoned project. We are kind of still experimenting with the protocol and a lot of infrastructure is missing (like token wallets). There is an inherent risk of having the token based on it. On the other hand, we want to support the BCH ecosystem and be one of the drivers for Bitcoin to grow. Tokens carry a big promise for the ecosystem growth and we decided to accept the risks of emerging technologies as one of the first projects issuing a token on the BCH SLP. If you have more question about SLP, I recommend to join the Telegram group of the project or contact James Cramer or Gabriel Cardona who work on it. Would you have a tutorial / help / instructions for this great network so that I could start contributing? I can show you the platform. I'd also love to know what did you have problems with on Honest. Can you write me on Telegram: @distributed_nomad ?